City-based entrepreneur, Xavier Augustin, describes in detail the best times of his life — being part of a management programme at Harvard. “One needs to keep going back to school to stay relevant,” believes Xavier Augustin, who has recently graduated from the Harvard Business School. Xavier, who always aspired to study at Harvard, found in the Owner/President Management (OPM) Programme a chance to refresh his management knowledge and stay on top of contemporary business values. 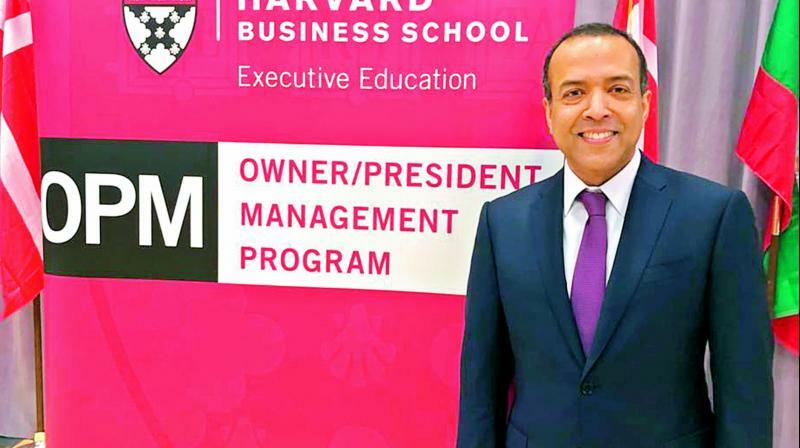 The OPM programme is offered for three weeks at a time over three consecutive years to CEOs and entrepreneurs at the Harvard campus in Boston. It helps one learn not only from the best professors but also from fellow CEOs and entrepreneurs from around the world. “Upon graduation, I am wondering if there is any other learning opportunity in the world for busy CEOs and entrepreneurs like the Harvard’s OPM. Where in one’s busy life can one expect to befriend CEOs of powerful and extraordinary businesses, almost like friends from school or childhood? Those who apply for the OPM are of a certain nature — gung-ho, amiable and optimistic about life and the future. The professors, the course content and the networking creates a magic potion that adds a new vigour to our lives. OPM has certainly sharpened my basic business concepts, expanded my horizon with new ideas, motivated me to transform my life and work and make a difference. What is important for a CEO is to be able to reflect and stay relevant. This programme does that in an effective way,” says Xavier. Interestingly, there were 136 CEOs from nearly 40 countries along with Xavier, who says that the classrooms and the living area were always abuzz with lively activities. “My classmates from India included the chief executives of Nilkamal, Luxor, TCI, MicroMax, Vikram Solar, Zuari Agro, Jaipur Living and GVK Hotels. Other interesting classmates included an investor in Spotify which went public last week, a Nigerian who literally owns a private navy, another who runs a regional airline, another who is the world’s largest exporter of basmati rice and another who is the largest exporter of human hair from India. Quite a of few of my classmates and now friends are serial entrepreneurs who have already sold their businesses and are preparing for the next new opportunity,” he reveals. Some of the professors who taught the OPM group were Professor Ananth Raman who taught operations, Professor Deepak Malhotra who taught negotiations, Professor Lynda Applegate who enlightened students about entrepreneurship, Professor Boris Groysberg who educated students about leadership, Professor Ramon who taught the need for a strategy, Professor Frank Cespedes who showed them how sales must always match the strategy and Professor Josh Lerner who taught how to raise funds from angels and private equity. Xavier says that the course is now helping him transform Y-Axis in many ways and is helping him create a clear strategy for the company.